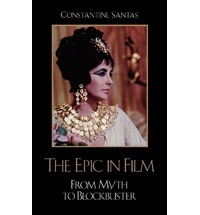 Constantine Santas encourages us to wonder why film critics have so routinely dismissed the epic film. In The Epic in Film, he argues that “blockbuster” and “artistic” are not mutually exclusive terms, and, perhaps more importantly, epic film is an inherently profound genre in its ability to tap into a nation’s, and sometimes humanity’s, dreams and fears. Why do we see dozens and dozens of films based on the King Arthur legend? Why would a presidential-hopeful borrow a phrase, ‘Read my lips,’ from Clint Eastwood’s Dirty Harry? Why do war epics proliferate in times of war or national crisis? Why are epics as a whole the most popular movie genre? Start with an individual quest of some kind undertaken by an attractive hero or heroine, add the weight of a nation, and perhaps humanity, into that character’s struggle, sprinkle some awe-inspiring special effects and a general sense of largesse, and don’t forget the happy ending; and there you have a recipe for a film that can contain the deepest emotions: fear, hope, insecurity, pride of a nation, and, sometimes, a world. Whether you love Gone with the Wind and hate Troy; find Akira Kurosawa’s films brilliant; or marvel over the depth of the Matrix trilogy, film buffs will want to read this first book-length treatment of the epic, a wildly popular, infinitely fascinating, and critically under appreciated genre.